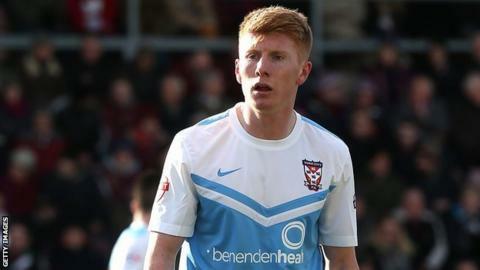 Brad Halliday cancelled out a late Matt Tubbs goal to earn York City a draw. The Fratton Park side controlled much of the game, hitting the woodwork three times, before Tubbs scored his ninth goal for Portsmouth with a low drive from the edge of the box. But the Minstermen hit back almost immediately as Halliday capitalised on a slip from Dan Butler and slotted in. It means Pompey finish 16th in League Two, five points above 18th-placed York, who end the season with 20 draws. "In the second half we played extremely well. Their keeper had an excellent afternoon. and we're unfortunate not to take all three points. "We'll be talking over the next few days. I want to be part of the club going forward so hopefully we can sort something out. "It's up to the chairman and the board who they bring in, I have no idea if that will be tomorrow or in a few weeks, but I've enjoyed my time as caretaker." "It was nice to get a late goal and for Brad to get it it was very fitting. He's been outstanding since coming in from Middlesbrough. "I'm delighted for the club. It moves us up a place as well and we haven't finished the season with a defeat. "We've finished with a good point at a difficult place." Match ends, Portsmouth 1, York City 1. Second Half ends, Portsmouth 1, York City 1. Corner, York City. Conceded by Adam Webster. Attempt blocked. Conor Chaplin (Portsmouth) right footed shot from the centre of the box is blocked. Attempt saved. Jake Hyde (York City) right footed shot from outside the box is saved in the top centre of the goal. Attempt saved. Matt Tubbs (Portsmouth) left footed shot from outside the box is saved in the centre of the goal. Substitution, Portsmouth. Bradley Tarbuck replaces Jed Wallace. Goal! Portsmouth 1, York City 1. Brad Halliday (York City) right footed shot from the centre of the box to the bottom left corner. Goal! Portsmouth 1, York City 0. Matt Tubbs (Portsmouth) right footed shot from outside the box to the bottom left corner. Foul by Conor Chaplin (Portsmouth). Brad Halliday (York City) wins a free kick on the left wing. Attempt missed. John McCombe (York City) right footed shot from outside the box is close, but misses to the right. Dan Butler (Portsmouth) is shown the yellow card. Foul by Dan Butler (Portsmouth). Brad Halliday (York City) wins a free kick in the defensive half. Substitution, York City. Shaun Miller replaces Shaquile Coulthirst. Corner, Portsmouth. Conceded by Robert Olejnik. Attempt saved. Adam Webster (Portsmouth) header from the centre of the box is saved in the bottom right corner. Attempt saved. James Dunne (Portsmouth) right footed shot from the centre of the box is saved in the top centre of the goal. Attempt missed. Luke Summerfield (York City) right footed shot from outside the box is close, but misses to the right. Hand ball by James Dunne (Portsmouth). James Dunne (Portsmouth) wins a free kick in the attacking half. Foul by Tom Platt (York City). Substitution, York City. Tom Platt replaces Michael Coulson. Attempt saved. Ben Close (Portsmouth) right footed shot from the centre of the box is saved in the centre of the goal. Adam Webster (Portsmouth) hits the left post with a header from very close range following a corner. Attempt saved. Ben Close (Portsmouth) right footed shot from the left side of the six yard box is saved in the bottom left corner. Attempt saved. Conor Chaplin (Portsmouth) left footed shot from outside the box is saved in the top centre of the goal. Corner, Portsmouth. Conceded by Femi Ilesanmi. Foul by Johannes Ertl (Portsmouth). Attempt saved. Brad Halliday (York City) right footed shot from outside the box is saved in the centre of the goal. Corner, Portsmouth. Conceded by Keith Lowe. Attempt blocked. Danny Hollands (Portsmouth) left footed shot from the centre of the box is blocked. Jed Wallace (Portsmouth) hits the right post with a right footed shot from a difficult angle on the left. Attempt saved. Jed Wallace (Portsmouth) left footed shot from the centre of the box is saved in the bottom left corner. Second Half begins Portsmouth 0, York City 0.